Funeral flower etiquette is a beautiful way to express your sympathy to the family of someone who has passed away. Flowers can bring beauty and life to a time of sorrow. As a family member or a friend, sometimes it is difficult to know what to say or how to show your love and support to those who have lost their loved one. Funeral flowers can speak volumes for you. 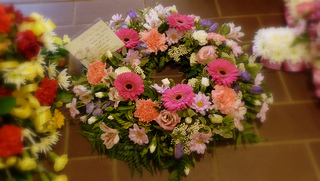 Sending a basket, wreath or spray will show that your thoughts are with them as they grieve. When a close family member passed away so many thoughtful people sent beautiful flowers for him. Many who knew him selected his favorite flowers for their arrangements. There were many arrangements that were made up in his favorite colors too. It was so meaningful to us, because they were a demonstration of how much he was loved and thought of. When selecting and sending flowers for a funeral, there are different types of arrangements you can select. They are named according to their function. Wreaths~ these are circular arrangements. They represent eternal life. Sprays~ these are arrangements that are shown on one side only. They normally are displayed on stands. Baskets~ these are arrangements made up of cut flowers or various plants held in beautiful baskets. Casket Sprays~ these are the arrangements that sit directly on top of the casket. They are generally selected by the immediate family members. Inside Pieces~ these are small floral arrangements that are placed inside the casket. Each arrangement will have a different meaning for the family. Wreaths and sprays are so beautiful and add so much warmth during this time. Baskets can be taken home and kept as a memory for the family. Good funeral flower etiquette is simply showing that you care and love them. The choice of flowers and the arrangements you select can be influenced by the religion of the person who has passed away, as well as their family. It is good funeral etiquette to find out whether or not there is a religious affiliation, and if so what it is. Some religions and cultures, such as Jewish and Muslim do not use flowers in their funeral services. It is better funeral etiquette to send a basket of fruit to the family. When selecting your arrangements, it is good to keep in mind the person and their family. Selecting flowers that hold meaning will add depth and beauty to your arrangements. The following is a brief list of flowers, as well as the meaning they have. The arrangements that you select should arrive at the funeral home before the first visitation begins. For the most part, the flower shop will take care of this for you when you order. Sometimes circumstances do not allow for you to have your arrangement delivered before the first visitation. It is appropriate for the flowers to be sent before the funeral services. Unfortunately there are times when you do not receive the news in a timely manner. It is still good funeral etiquette of send a basket of flowers and plants to the home of the family after the funeral has taken place. You can personally deliver them and spend some time with the family. There are times when the family has requested that flowers not be sent. It is good funeral manners to honor their wishes. In most cases the family would rather that a donation to a charity (which they list) or a trust fund for those who are left behind be made in the deceased person's name. This would have more meaning to them. Use good sympathy etiquette in all good cases. Funeral flower etiquette is the demonstration of love, sympathy and support for the family. They say so much when you may not have the words.